A healthy breakfast is very important! Punta Chica´s “Dolphins” and “Whales” are learning about “healthy habits”. First, they discussed facts they already knew, for example “junk food is not good for you” and “is good to exercise”. After investigating in books, encyclopedias and the internet, they learned that not all food is healthy and the need to have balanced meals in order to be healthy and strong. 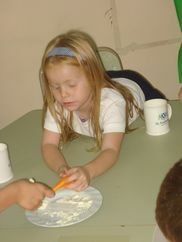 We introduced a new healthy snack at school: sliced carrots dipped in cream cheese. It was a great success!! To end the project, last Friday they shared a “healthy breakfast” together, with all they yummy food they brought.